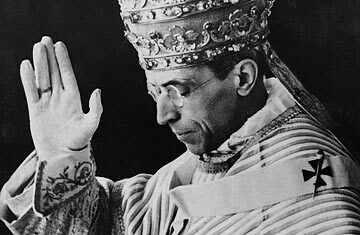 Benedict's Pope: Should Pius XII Become a Saint? The Catholic Church's process of declaring saints is a complex and fascinating one. On Saturday, Pope Benedict XVI announced that several candidates for sainthood had reached the initial "venerable" status, having been shown by a Vatican committee to have lived heroically virtuous lives. If a scientifically inexplicable miracle is subsequently attributed to their post-mortem intercession, the second step of "beatification" takes place, followed by eventual canonization if a second miracle is proven. Two popes were among the new "venerables." The first was Benedict's still-mega-popular predecessor, John Paul II. The other, however, has doubts swirling around his legacy more than half-a-century after his passing. The inclusion of Pope Piux XII among the venerables brought howls of protest from Jewish groups across Europe and the world. There are long-standing accusations from some Holocaust scholars and Jewish leaders that Pius did little to try to stop the Nazi extermination of some six million Jews, and other ethnic minorities as well as homosexuals and the disabled. Pius defenders say he quietly worked to provide shelter for some Jews in Rome, and avoided public denunciations of Hitler's Final Solution because it would have prompted a Nazi backlash. After the German-born Cardinal Joseph Ratzinger rose to the chair of St. Peter, he initially decided to shelve Pius' candidacy for sainthood for further study and an examination of documents in the Vatican archive. With debate still heated about the historical facts  and with Benedict, a German of that era, in the papacy  many observers believed it might just be better for his successors to make the call on Pius' virtues. So what changed? The guidelines are quite rigid for the Congregation for the Causes of Saints to verify what qualifies as the necessary "heroic virtues" for the venerable. But ultimately it is the Pope who decides whether to sign the decree. And though his papacy can sometimes seem by-the-book, certain Benedict decisions must be mined for personal motivations. Joseph Ratzinger was a devout 12-year-old in the heavily Catholic region of Bavaria when Eugenio Pacelli became Pope in 1939. Through his early years as priest and theologian, Ratzinger remained devoted to Pius until the pontiff's death in 1958. A Vatican insider once described Benedict's memory to this particular predecessor this way: "Pius is really his Pope." Being a German of that era may, in fact, have been part of what drove Benedict to ultimately declare Pius venerable, and on the road to sainthood. What if the archives didn't resolve the issue for historians? What if the next Pope doesn't have the personal memories of Pacelli? Benedict may have felt he needed to act to ensure that the record showed that his Pope was a man of saintly virtues. In other discourses, notably one delivered on a 2006 trip to Auschwitz, Benedict has spoken about how Catholics and Germans of good faith  like himself  were also victims of the Nazis, who he referred to as a "ring of criminals," roundly absolving the German people even as historians and sociologists continue to study the widespread acceptance of the regime's actions. The son of a Catholic police officer who didn't like the Nazis, the young Joseph Ratzinger was conscripted into the Hitler Youth against his will. Therefore, in Benedict's view, the ultimate failure of Christian Europe to stop Hitler's slaughter doesn't seem to be a topic really worth pursuing. Whether Pius' sheltering some Roman families was the best result he could have achieved, or whether he should have better and more courageously used his diplomatic channels and bully pulpit is not a question the current Pope is driven to answer. Benedict's decision to move Pius' cause for sainthood forward is a declaration that the wartime Pope was a Catholic in good faith, a victim of the historical events that did not afford him the means to stop the bloodshed around him. In a way, that is just like the future German Pope himself. Jewish groups, who still remember John Paul II's historic efforts to open dialogue across religious boundaries, were furious at the Vatican announcement. Benedict's planned visit next month to Rome's central synagogue is officially still on, but Italy's Jewish leaders are upset by the news. It follows a string of perceived slights and slip-ups by Benedict, including his bringing back into the fold followers of the movement founded by arch-traditionalist French Archbishop Marcel Lefebvre. A speech the Pope gave in May at Jerusalem's Holocaust memorial also left many Jews disappointed at its vagueness about the German role in events and the numbers of people murdered. The strongest language in response to the Pius announcement came from Benedict's native Germany, where Stephan Kramer, who heads the country's Central Jewish Council called it a "hijacking of historical facts concerning the Nazi era." He said that Benedict "rewrites history without having allowed a serious scientific discussion. That's what makes me furious." There are still plans to open the relevant archives in 2014. But unless some shocking proof emerges that shows Pius didn't care about the Jews' fate, Benedict's declaring him venerable will stand as the Catholic Church's definitive absolution of historical guilt, of both Pius and the Church itself.